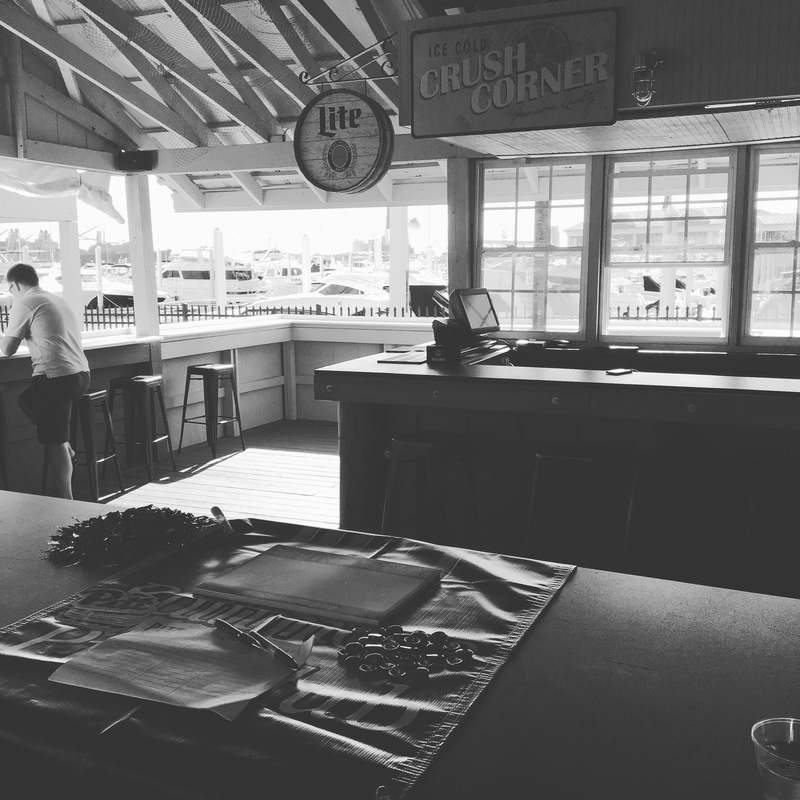 Canton Boat House Dock Bar – eating my way through Charm City! I have been to the Dock Bar three times since they have opened. Once invited because of this blog, once when I took a large group and once just with friends. I have seriously mixed opinions. Most of the pics and the better experience was through a media dinner – in which we had different portion sizes and plates than what most may experience as a traditional guest. It truly is a gorgeous setting – outside overlooking the marinas in Canton. On a sun-shining day, there really are few better places. Chef Matt Campbell is quite impressive – he knows what he likes and really enjoys talking about food. 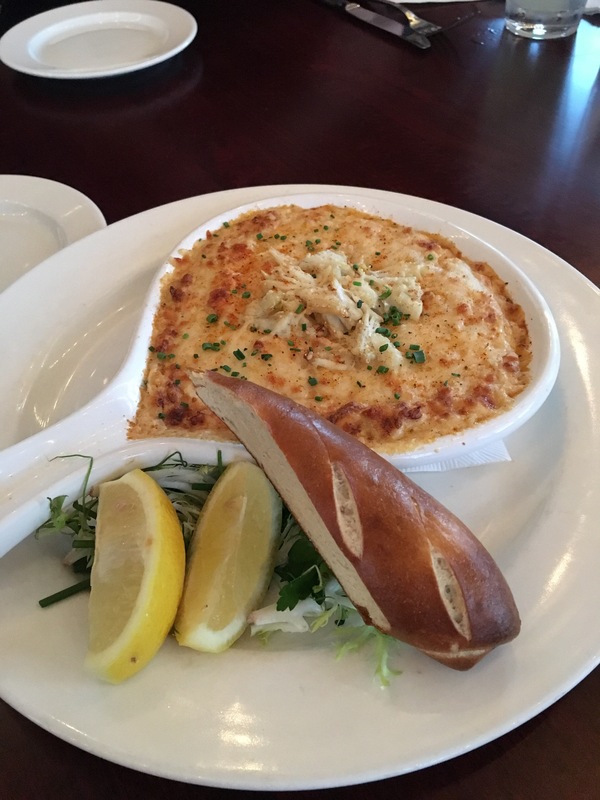 We started with the crab dip; it was more on the creamy side. It come with pretzels on the side. As a lover of food in Charm City, I am picky about crab and crab dip. I will not be rushing back for this. If you are an Old Bay fan, you will like this. If you are a huge lumps of crab fan, you might want to pick some other crab items, or be the first one to dig in and grab the chunks on top. We tried most of the Dock Bar menu items, like the pimento cheese and the wings. 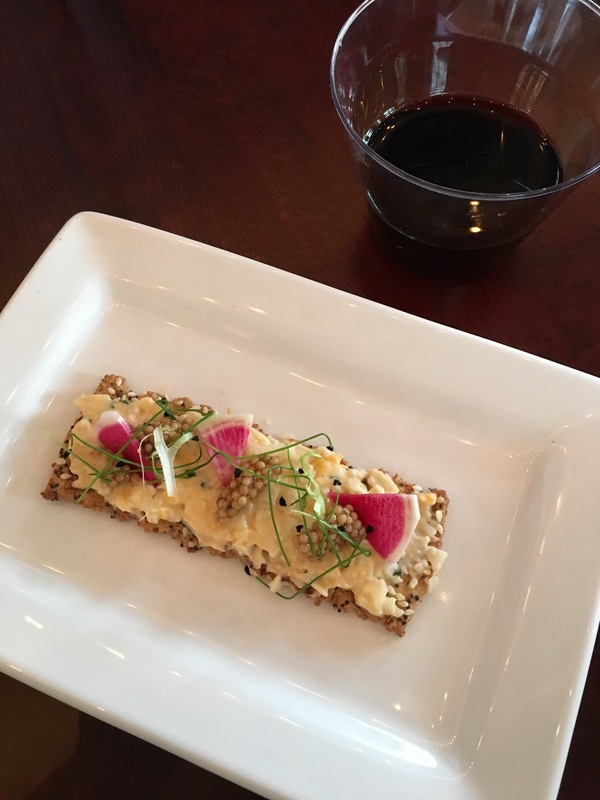 The creamy pimento cheese with “mustard caviar” and pickled watermelon on a pepper cracker. I liked the cheese dip, but wasn’t a huge fan of the cracker and the way it crumbled when you eat. The honey old bay-wings were super crispy and still juicy on the outside. A bit spicy and a little bit sweet. I would definitely order those again. One of my favs of the night might have been the summer greens salad. Tons of spicy arugula and crunchy kale. I loved the addition of quinoa and chick peas to add some depth and texture. The nectarines and pickled red onions gave some sweet and savory notes. And please, goat cheese? What’s not to love. The raspberry walnut vinaigrette did not overshadow. 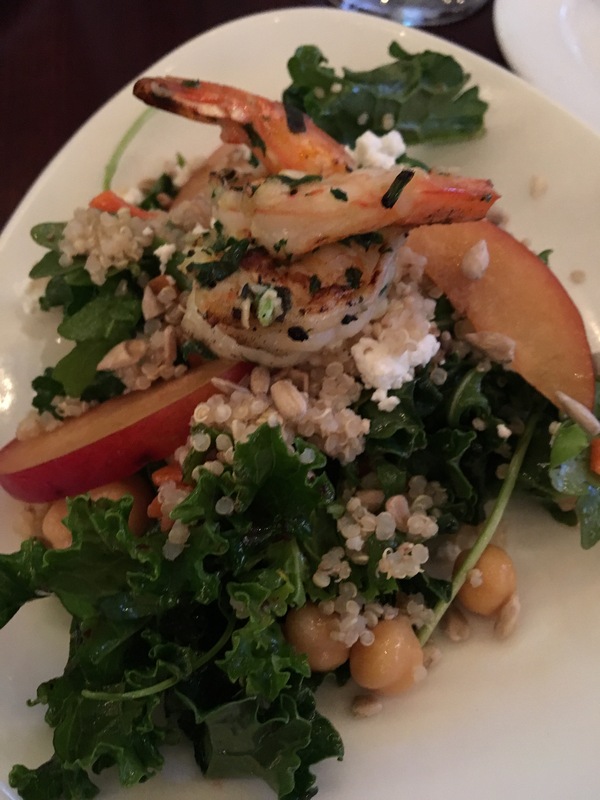 Chef topped ours with a little grilled shrimp – perfect! By the time the sliders and tacos hit the tables, I was stuffed but this girl will make room for tacos. Sliders were tasty too. I actually enjoyed the crab cake ones best – finally some large lumps of crab. 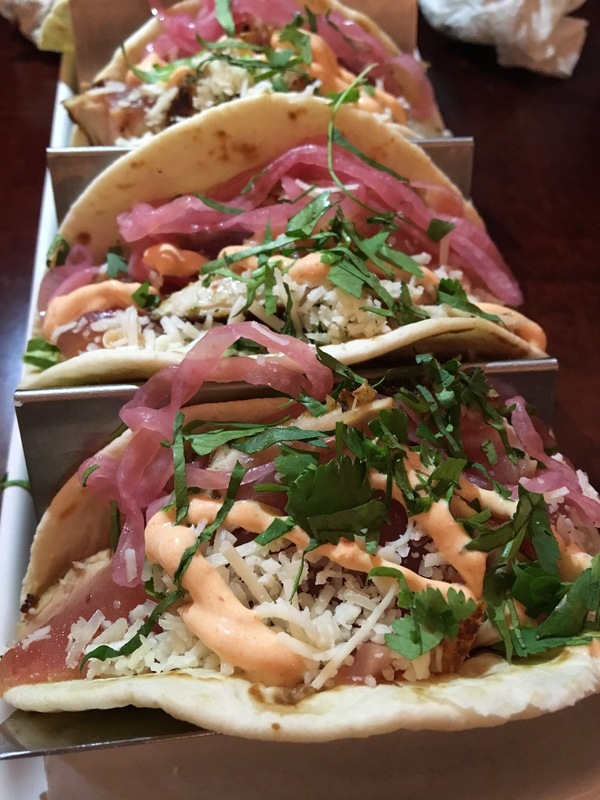 The tacos – filled to the brim with your choice of tuna, Mahi Mahi, or pork. I tried the Ahi Tuna ones – the tuna was blackened and seared to a beautiful rare and topped with shredded crisp lettuce, a little fresh pico de gallo, and tangy pickled red onions. I don’t mind the American flour tortilla style with the addition of Cotija Cheese, and a sour cream with cilantro and a hint of sriracha heat. I must say, this is not a spot for you to bring a large group, unless you have tons of money and plan a per person charge. And don’t for a second thinking of putting up a sign or a table topper to mark to your group where you are. Furthermore, despite asking in advance, you can’t actually stake out a table before all of your group gets there. I found the hospitality of the bar staff and a manager team disappeared when I transitioned from “media” to guest. This entry was posted in Canton, Charm City, Dinner, Meh.. Bookmark the permalink.